Hundreds of robots deliver packages to people's front doors any time they want using autonomous six-wheel robots. Users who sign up (on a) mobile phone app receive a "personal address" in place of their home address for their packages. These will be delivered to a sorting hub and then assigned to a delivery robot. The robot can be ordered to trundle to their front door at a convenient time, while users can track its progress from the company's app. Deliveries will cost users a subscription fee of £7.99 per month. Users who sign up to Starship's mobile phone app will receive a "personal address" in place of their home address for their packages. These will be delivered to a Starship sorting hub and then assigned to a delivery robot. The robot can then be ordered to trundle to their front door at a convenient time, while users can track its progress from the company's app. Deliveries will cost users a subscription fee of £7.99 per month. 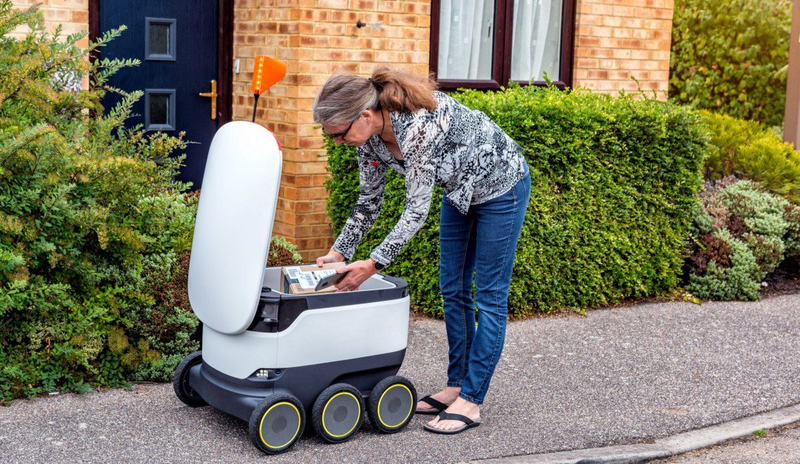 The company has already been running a fleet of around 20 delivery robots in Milton Keynes for food delivery working with the Cooperative. The company chose Milton Keynes as its test bed due to the modern road and pavement infrastructure, making it robot friendly. The robots are able to autonomously navigate road crossings and zebra crossings using a mix of GPS, cameras and radar to look out for oncoming traffic. However, Starship does employ a number of remote drivers if the robots encounter a "dangerous" situation. Bayer joined Starship as chief executive from Airbnb earlier this year. The start-up recently raised $25m (£19m) to expand its technology and bring it to the streets. The driverless robots stick to pavements and paths, keeping them out of the way of cars. For its pilot food delivery service, users can simply drop a pin on a map to get the package delivered to an exact location. The robots move at 4mph and can navigate around objects using cameras and radar technology. Starship was founded in 2014 by Skype co-founders Ahti Heinla and Janus Friis. It is headquartered in San Francisco but has a base in London. Starship said its delivery robots have travelled over 125,000 in 100 countries. It joins the likes of Amazon, which has been testing autonomous delivery drones out of Cambridge.